A few weeks ago, I found these darling-FUN treat bags over at The Farm Chicks Blog. Serena was sweet enough to offer these to all of us as a free down-loadable printable. Thank you! I couldn't believe how fun they were to make and fill with candies. I found this recipe over at Tasty Kitchen and adapted it for our family. Brown ground burger with salt, pepper and onions until no longer pink. After noodles are cooked, drain and drizzle with olive oil. Mix in your spaghetti sauce. Add your burger, seasonings, cheeses, and sour cream. Fold together and allow it all to combine and melt together, over low heat, for about 5 minutes, or until cheese is melted. 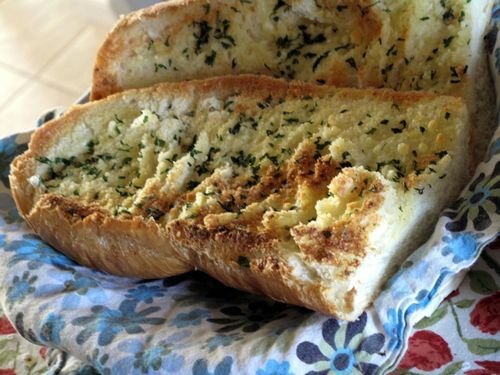 You gotta have the Garlic Bread.......here's the way we make it :) So GOOD! Sunday Italian never looked so good! We found this recipe over at Family Favorite Recipes but instead made them into sandwiches. In large zip lock bag, add chicken and enough marinade to generously coat chicken. In another large zip lock bag, add bacon with enough marinade to coat. Grill chicken, only turning once. Usually about 6 to 7 minutes on each side. Add bacon to grill after you've turned the chicken over. Bacon cooks a lot faster than the chicken. Grill Kaiser rolls, just until slightly browned. Grill pineapple rings. Place chicken, bacon and pineapple on Kaiser rolls. YUM! Brown turkey burger, salt, pepper and onion in frying pan until meat is no longer pink. Heat flour tortillas in skillet on low to medium heat. Top each tortilla with turkey burger and cheese. Fold one side of tortilla over and flip. Cook on each side until just slightly golden brown. Add additional cheese, green chilis, sour cream and salsa if desired. You can also add your green chiles to your turkey burger mixture.